SMAD 4, also called SMAD family member n°4, Mothers against decapentaplegic homolog 4, or DPC4 (Deleted in Pancreatic Cancer-4) is a protein involved in cell signaling in mammals. It belongs to the proteins of the SMAD family. SMAD 4 participates in chain reactions inside cells where it interacts with other members of the SMAD family such as SMAD2 or SMAD3. SMAD 4 forms with SMAD 3 a complex which can bind to DNA and modify the expression of several genes related to cellular activities such as proliferation or differentiation. The complex SMAD 3-SMAD 4 is therefore a transcription factor. Intracellular reactions involving SMAD 4 are triggered by the binding, on the surface of the cells, of growth factors from the TGFβ family. The sequence of intracellular reactions involving SMADS is called the SMAD pathway or the transforming growth factor beta (TGF-β) pathway since the sequence starts with the recognition of TGF-β by cells. SMAD 4 belongs to the co-SMAD group, the second class of the SMAD family. SMAD 4 is the only known co-SMAD in mammals. 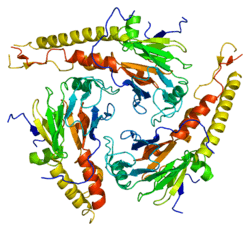 It also belongs to the Darwin family of proteins that modulate members of the TGFβ protein superfamily, a family of proteins that all play a role in the regulation of cellular responses. Mammalian SMAD 4 is a homolog of the Drosophila protein "Mothers against decapentaplegic" or MAD. SMAD family member 4 is a 552 amino-acid polypeptide with a molecular weight of 60 439 daltons. This protein is composed of only one chain of amino acids. SMAD 4 is always coded in mammals by a gene located on chromosome 18. In humans, the protein is coded by the SMAD 4 gene, which is located in the region 21.1 of chromosome 18. The human gene contains 54 829 base pairs and is located from pair n° 51,030,212 to pair 51,085,041. Pattern of the chromosome 18 in Homo sapiens. 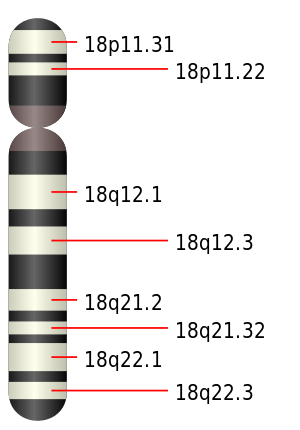 The SMAD 4 gene is located on the long arm of the chromosome, at locus 21.1. This locus corresponds to the black stripe between the regions 12.3 and 21.2. SMAD 4 has a tri-dimensional structure and two functional domains known as MH1 and MH2. The letters M and H stand for MAD Homology and refer to the similarity between mammals SMAD 4 and the Drosophilia protein Mothers against decapentaplegic (MAD). SMAD 4 is composed of three major domains, including MH1 (up), MH2 (down) and a linking domain (right). The MH1 domain, corresponding to the N-terminus, contains amino-acids with physical and chemical properties that give SMAD 4 specific DNA-binding properties. This region recognizes a specific DNA sequence composed of eight nucleotides: G-T-C-T-A-G-A-C. The sequence is also recognized by SMAD 3, which forms a protein complex with SMAD 4 in the cytoplasm of mammalian cells. It is therefore sometimes called the "consensus sequence" but is mostly known as Smad-binding DNA element (SBE). The MH1 domain facilitates the binding of SMAD 4 to receptors such as SMAD 2 and SMAD 3 which belong to the R-SMAD group (first class of the SMAD family) by interacting with their phosphorylated MH2 domain. The MH2 domain, corresponding to the C-terminus, is responsible for receptor recognition, DNA binding and association with other SMADs. Just as the MH1 domain interacts with the R-SMADS MH2 domain, the SMAD 4 MH2 domain directly interacts with their MH1 domain. SMAD 4 can therefore form with other SMADS heterodimers and heterotrimers. SMADs are highly conserved across species, especially in the N terminal MH1 domain and the C terminal MH2 domain. The SMAD proteins are homologs of both the Drosophila protein MAD and the C. elegans protein SMA. The name is a combination of the two. During Drosophila research, it was found that a mutation in the gene MAD in the mother repressed the gene decapentaplegic in the embryo. The phrase "Mothers against" was added, since mothers often form organizations opposing various issues, e.g. Mothers Against Drunk Driving (MADD), reflecting "the maternal-effect enhancement of dpp"; and based on a tradition of unusual naming within the research community. SMAD 4 is also known as DPC4, JIP or MADH4. SMAD 4 is a protein defined as an essential effector in the SMAD pathway. SMAD 4 serves as a mediator between extracellular growth factors from the TGFβ family and genes inside the cell nucleus. The abbreviation co in co-SMAD stands for common mediator. SMAD 4 is also defined as a signal transducer. In the TGF-β pathway, TGF-β dimers are recognized by a transmembrane receptor, known as type II receptor. Once the type II receptor is activated by the binding of TGF-β, it phosphorylates a type I receptor. Type I receptor is also a cell surface receptor. This receptor then phosphorylates intracellular receptor regulated SMADS (R-SMADS) such as SMAD 2 or SMAD 3. The phosphorylated R-SMADS then bind to SMAD 4. The R-SMADs-SMAD 4 association is a heteromeric complex. This complex is going to move from the cytoplasm to the nucleus: it is the translocation. SMAD4 may form heterotrimeric, heterohexameric or heterodimeric complexes with R-SMADS. Smad4 is a substrate of the Erk/MAPK kinase  and GSK3. The FGF (Fibroblast Growth Factor) pathway stimulation leads to Smad4 phosphorylation by Erk of the canonical MAPK site located at Threonine 277. This phosphorylation event has a dual effect on Smad4 activity. First, it allows Smad4 to reach its peak of transcriptional activity by activating a growth factor-regulated transcription activation domain located in the Smad4 linker region, SAD (Smad-Activation Domain). Second, MAPK primes Smad4 for GSK3-mediated phosphorylations that cause transcriptional inhibition and also generate a phosphodegron used as a docking site by the ubiquitin E3 ligase Beta-transducin Repeat Containing (beta-TrCP) that polyubiquitinates Smad4 and targets it for degradation in the proteasome. Smad4 GSK3 phosphorylations have been proposed to regulate the protein stability during pancreatic and colon cancer progression. In the nucleus the heteromeric complex binds promoters and interact with transcriptional activators. SMAD3/SMAD4 complexes can directly bind the SBE. These associations are weak and require additional transcription factors such as members of the AP-1 family, TFE3 and FoxG1 to regulate gene expression. Many TGFβ ligands use this pathway and subsequently SMAD4 is involved in many cell functions such as differentiation, apoptosis, gastrulation, embryonic development and the cell cycle. Genetic experiments such as gene knockout (KO), which consist in modifying or inactivating a gene, can be carried out in order to see the effects of a dysfunctional SMAD 4 on the study organism. Experiments are often conducted in the house mouse (Mus musculus). It has been shown that, in mouse KO of SMAD4, the granulosa cells, which secrete hormones and growth factors during the oocyte development, undergo premature luteinization and express lower levels of follicle-stimulating hormone receptors (FSHR) and higher levels of luteinizing hormone receptors (LHR). This may be due in part to impairment of bone morphogenetic protein-7 effects as BMP-7 uses the SMAD4 signaling pathway. Deletions in the genes coding for SMAD1 and SMAD5 have also been linked to metastasic granulosa cell tumors in mice. SMAD4, is often found mutated in many cancers. The mutation can be inherited or acquired during an individual’s lifetime. If inherited, the mutation affects both somatic and sexual cells. If the SMAD 4 mutation is acquired, it will only exist in certain somatic cells. Indeed, SMAD 4 is not synthesized by all cells. The protein is present in skin, pancreatic, colon, uterus and epithelial cells. It is also produced by fibroblasts. The functional SMAD 4 participates in the regulation of the TGF-β signal transduction pathway, which negatively regulates growth of epithelial cells and the extracellular matrix (ECM). When the structure of SMAD 4 is altered, expression of the genes involved in cell growth is no longer regulated and cell proliferation can go on without any inhibition. The important number of cell divisions leads to the forming of tumors and then to multiploid colorectal cancer and pancreatic carcinoma. It is found inactivated in at least 50% of pancreatic cancers. Somatic mutations found in human cancers of the MH1 domain of SMAD 4 have been shown to inhibit the DNA-binding function of this domain. SMAD 4 is also found mutated in the autosomal dominant disease juvenile polyposis syndrome (JPS). JPS is characterized by hamartomatous polyps in the gastrointestinal (GI) tract. These polyps are usually benign, however they are at greater risk of developing gastrointestinal cancers, in particular colon cancer. Around 60 mutations causing JPS have been identified. They have been linked to the production of a smaller SMAD 4, with missing domains that prevent the protein from binding to R-SMADS and forming heteromeric complexes. Mutations in SMAD4 (mostly substitutions) can cause Myhre syndrome , a rare inherited disorder characterized by mental disabilities, short stature, unusual facial features, and various bone abnormalities. ↑ Lin X, Liang M, Liang YY, Brunicardi FC, Melchior F, Feng XH (May 2003). "Activation of transforming growth factor-beta signaling by SUMO-1 modification of tumor suppressor Smad4/DPC4". The Journal of Biological Chemistry. 278 (21): 18714–18719. doi:10.1074/jbc.M302243200. PMID 12621041. ↑ "SMAD4 SMAD family member 4". Entrez Gene. 1 2 "SMAD 4". The Genetics Home Reference Website. 1 2 Roelen BA, Cohen OS, Raychowdhury MK, Chadee DN, Zhang Y, Kyriakis JM, Alessandrini AA, Lin HY (Oct 2003). "Phosphorylation of threonine 276 in Smad4 is involved in transforming growth factor-beta-induced nuclear accumulation". American Journal of Physiology. Cell Physiology. 285 (4): C823–30. doi:10.1152/ajpcell.00053.2003. PMID 12801888. ↑ Zawel L, Dai JL, Buckhaults P, Zhou S, Kinzler KW, Vogelstein B, Kern SE (Mar 1998). "Human Smad3 and Smad4 are sequence-specific transcription activators". Molecular Cell. 1 (4): 611–617. doi:10.1016/s1097-2765(00)80061-1. PMID 9660945. ↑ Sekelsky JJ, Newfeld SJ, Raftery LA, Chartoff EH, Gelbart WM (Mar 1995). "Genetic characterization and cloning of mothers against dpp, a gene required for decapentaplegic function in Drosophila melanogaster" (PDF). Genetics. 139 (3): 1347–58. PMC 1206461 . PMID 7768443. ↑ White M (26 September 2014). "Sonic Hedgehog, DICER, and the Problem With Naming Genes". Pacific Standard. ↑ Roelen BA, Cohen OS, Raychowdhury MK, Chadee DN, Zhang Y, Kyriakis JM, Alessandrini AA, Lin HY (Oct 2003). "Phosphorylation of threonine 276 in Smad4 is involved in transforming growth factor-beta-induced nuclear accumulation". American Journal of Physiology. Cell Physiology. 285 (4): C823–30. doi:10.1152/ajpcell.00053.2003. PMID 12801888. ↑ Demagny H, Araki T, De Robertis EM (Oct 2014). "The tumor suppressor Smad4/DPC4 is regulated by phosphorylations that integrate FGF, Wnt, and TGF-β signaling". Cell Reports. 9 (2): 688–700. doi:10.1016/j.celrep.2014.09.020. PMID 25373906. ↑ de Caestecker, Mark P. (2000). "The Smad4 Activation Domain (SAD) Is a Proline-rich, p300-dependent Transcriptional Activation Domain". The Journal of Biological Chemistry. 275 (3): 2115–2122. doi:10.1074/jbc.275.3.2115. PMID 10636916. ↑ Demagny H, De Robertis EM (2015). "Smad4/DPC4: a Barrier against Tumor Progression driven by RTK/Ras/Erk and Wnt/GSK3 signaling". Molecular & Cellular Oncology. 3 (2): e989133. doi:10.4161/23723556.2014.989133. ↑ Demagny H, De Robertis EM (2015). "Point Mutations in the Tumor Suppressor Smad4/DPC4 Enhance its Phosphorylation by GSK3 and Reversibly Inactivate TGF-β Signaling". Molecular & Cellular Oncology. 3: e1025181. doi:10.1080/23723556.2015.1025181. ↑ Inman GJ (Feb 2005). "Linking Smads and transcriptional activation". The Biochemical Journal. 386 (Pt 1): e1–e3. doi:10.1042/bj20042133. PMC 1134782 . PMID 15702493. ↑ Shi J, Yoshino O, Osuga Y, Nishii O, Yano T, Taketani Y (Mar 2010). "Bone morphogenetic protein 7 (BMP-7) increases the expression of follicle-stimulating hormone (FSH) receptor in human granulosa cells". Fertility and Sterility. 93 (4): 1273–9. doi:10.1016/j.fertnstert.2008.11.014. PMID 19108831. ↑ Pangas SA, Li X, Robertson EJ, Matzuk MM (Jun 2006). "Premature luteinization and cumulus cell defects in ovarian-specific Smad4 knockout mice". Molecular Endocrinology. 20 (6): 1406–22. doi:10.1210/me.2005-0462. PMID 16513794. ↑ Cotran RS, Kumar V, Fausto N, Robbins SL, Abbas AK (2005). Robbins and Cotran pathologic basis of disease (7th ed.). St. Louis, Mo: Elsevier Saunders. ISBN 0-7216-0187-1. ↑ "Growth-Mental Deficiency Syndrome of Myhre". National Organization for rare disorders. ↑ Caputo V, Bocchinfuso G, Castori M, Traversa A, Pizzuti A, Stella L, Grammatico P, Tartaglia M (Jul 2014). "Novel SMAD4 mutation causing Myhre syndrome". American Journal of Medical Genetics Part A. 164A (7): 1835–40. doi:10.1002/ajmg.a.36544. PMID 24715504. Miyazono K (2000). "TGF-beta signaling by Smad proteins". Cytokine & Growth Factor Reviews. 11 (1–2): 15–22. doi:10.1016/S1359-6101(99)00025-8. PMID 10708949. Wrana JL, Attisano L (2000). "The Smad pathway". Cytokine & Growth Factor Reviews. 11 (1–2): 5–13. doi:10.1016/S1359-6101(99)00024-6. PMID 10708948. Verschueren K, Huylebroeck D (2000). "Remarkable versatility of Smad proteins in the nucleus of transforming growth factor-beta activated cells". Cytokine & Growth Factor Reviews. 10 (3–4): 187–99. doi:10.1016/S1359-6101(99)00012-X. PMID 10647776. Massagué J (1998). "TGF-beta signal transduction". Annual Review of Biochemistry. 67: 753–91. doi:10.1146/annurev.biochem.67.1.753. PMID 9759503. Klein-Scory S, Zapatka M, Eilert-Micus C, Hoppe S, Schwarz E, Schmiegel W, Hahn SA, Schwarte-Waldhoff I (2008). "High-level inducible Smad4-reexpression in the cervical cancer cell line C4-II is associated with a gene expression profile that predicts a preferential role of Smad4 in extracellular matrix composition". BMC Cancer. 7: 209. doi:10.1186/1471-2407-7-209. PMC 2186346 . PMID 17997817. Kalo E, Buganim Y, Shapira KE, Besserglick H, Goldfinger N, Weisz L, Stambolsky P, Henis YI, Rotter V (Dec 2007). "Mutant p53 attenuates the SMAD-dependent transforming growth factor beta1 (TGF-beta1) signaling pathway by repressing the expression of TGF-beta receptor type II". Molecular and Cellular Biology. 27 (23): 8228–42. doi:10.1128/MCB.00374-07. PMC 2169171 . PMID 17875924. Aretz S, Stienen D, Uhlhaas S, Stolte M, Entius MM, Loff S, Back W, Kaufmann A, Keller KM, Blaas SH, Siebert R, Vogt S, Spranger S, Holinski-Feder E, Sunde L, Propping P, Friedl W (Nov 2007). "High proportion of large genomic deletions and a genotype phenotype update in 80 unrelated families with juvenile polyposis syndrome". Journal of Medical Genetics. 44 (11): 702–9. doi:10.1136/jmg.2007.052506. PMC 2752176 . PMID 17873119. Ali S, Cohen C, Little JV, Sequeira JH, Mosunjac MB, Siddiqui MT (Oct 2007). "The utility of SMAD4 as a diagnostic immunohistochemical marker for pancreatic adenocarcinoma, and its expression in other solid tumors". Diagnostic Cytopathology. 35 (10): 644–8. doi:10.1002/dc.20715. PMID 17854080. Milet J, Dehais V, Bourgain C, Jouanolle AM, Mosser A, Perrin M, Morcet J, Brissot P, David V, Deugnier Y, Mosser J (Oct 2007). "Common variants in the BMP2, BMP4, and HJV genes of the hepcidin regulation pathway modulate HFE hemochromatosis penetrance". American Journal of Human Genetics. 81 (4): 799–807. doi:10.1086/520001. PMC 2227929 . PMID 17847004. Salek C, Benesova L, Zavoral M, Nosek V, Kasperova L, Ryska M, Strnad R, Traboulsi E, Minarik M (Jul 2007). "Evaluation of clinical relevance of examining K-ras, p16 and p53 mutations along with allelic losses at 9p and 18q in EUS-guided fine needle aspiration samples of patients with chronic pancreatitis and pancreatic cancer". World Journal of Gastroenterology. 13 (27): 3714–20. doi:10.3748/wjg.v13.i27.3714. PMC 4250643 . PMID 17659731. Sebestyén A, Hajdu M, Kis L, Barna G, Kopper L (Sep 2007). "Smad4-independent, PP2A-dependent apoptotic effect of exogenous transforming growth factor beta 1 in lymphoma cells". Experimental Cell Research. 313 (15): 3167–74. doi:10.1016/j.yexcr.2007.05.028. PMID 17643425. Martin MM, Buckenberger JA, Jiang J, Malana GE, Knoell DL, Feldman DS, Elton TS (Sep 2007). "TGF-beta1 stimulates human AT1 receptor expression in lung fibroblasts by cross talk between the Smad, p38 MAPK, JNK, and PI3K signaling pathways". American Journal of Physiology. Lung Cellular and Molecular Physiology. 293 (3): L790–9. doi:10.1152/ajplung.00099.2007. PMC 2413071 . PMID 17601799. Levy L, Howell M, Das D, Harkin S, Episkopou V, Hill CS (Sep 2007). "Arkadia activates Smad3/Smad4-dependent transcription by triggering signal-induced SnoN degradation". Molecular and Cellular Biology. 27 (17): 6068–83. doi:10.1128/MCB.00664-07. PMC 1952153 . PMID 17591695. Grijelmo C, Rodrigue C, Svrcek M, Bruyneel E, Hendrix A, de Wever O, Gespach C (Aug 2007). "Proinvasive activity of BMP-7 through SMAD4/src-independent and ERK/Rac/JNK-dependent signaling pathways in colon cancer cells". Cellular Signalling. 19 (8): 1722–32. doi:10.1016/j.cellsig.2007.03.008. PMID 17478078. Sonegawa H, Nukui T, Li DW, Takaishi M, Sakaguchi M, Huh NH (Jul 2007). "Involvement of deterioration in S100C/A11-mediated pathway in resistance of human squamous cancer cell lines to TGFbeta-induced growth suppression". Journal of Molecular Medicine. 85 (7): 753–62. doi:10.1007/s00109-007-0180-7. PMID 17476473. Sheikh AA, Vimalachandran D, Thompson CC, Jenkins RE, Nedjadi T, Shekouh A, Campbell F, Dodson A, Prime W, Crnogorac-Jurcevic T, Lemoine NR, Costello E (Jun 2007). "The expression of S100A8 in pancreatic cancer-associated monocytes is associated with the Smad4 status of pancreatic cancer cells". Proteomics. 7 (11): 1929–40. doi:10.1002/pmic.200700072. PMID 17469085. Popović Hadzija M, Korolija M, Jakić Razumović J, Pavković P, Hadzija M, Kapitanović S (Apr 2007). "K-ras and Dpc4 mutations in chronic pancreatitis: case series". Croatian Medical Journal. 48 (2): 218–24. PMC 2080529 . PMID 17436386. Losi L, Bouzourene H, Benhattar J (May 2007). "Loss of Smad4 expression predicts liver metastasis in human colorectal cancer". Oncology Reports. 17 (5): 1095–9. doi:10.3892/or.17.5.1095. PMID 17390050. Karlsson G, Blank U, Moody JL, Ehinger M, Singbrant S, Deng CX, Karlsson S (Mar 2007). "Smad4 is critical for self-renewal of hematopoietic stem cells". The Journal of Experimental Medicine. 204 (3): 467–74. doi:10.1084/jem.20060465. PMC 2137898 . PMID 17353364. Takano S, Kanai F, Jazag A, Ijichi H, Yao J, Ogawa H, Enomoto N, Omata M, Nakao A (Mar 2007). "Smad4 is essential for down-regulation of E-cadherin induced by TGF-beta in pancreatic cancer cell line PANC-1". Journal of Biochemistry. 141 (3): 345–51. doi:10.1093/jb/mvm039. PMID 17301079.